In the days after a lone gunman at a Baptist church in Sutherland Springs left at least 26 people dead, some members of the Texas Legislature are pushing for their fellow legislators and other top officials to examine whether the state's gun laws need to be changed. Nevárez proposed limiting the ability of Texans to "walk around" with long rifles, such as the AR-15 variant used by the shooter Sunday. Texas has allowed long gun owners to openly carry their weapons for decades. Collier urged state leaders to declare gun violence a public health issue, comparing it to other health crises such as obesity and the opioid epidemic. She also denounced those, such as President Donald Trump, who have focused on addressing mental health issues following the shooting rather than guns themselves. While acknowledging mental health plays a critical role in gun violence, she said focusing entirely on mental health is a "distraction" from the role of easy access to guns and "stigmatizes" those with mental health issues. "If any other consumer product resulted in a fraction of the injuries and deaths [that guns do]," Collier said, "we would be scrambling to find solutions." 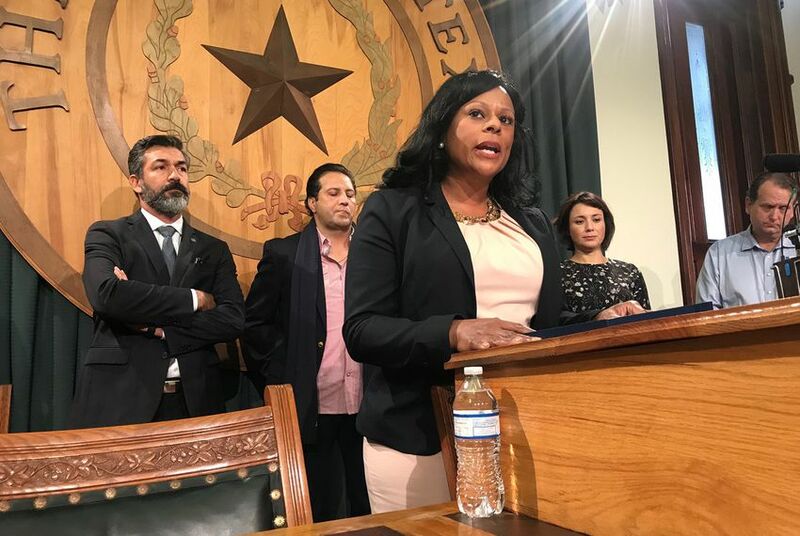 The press conference came a day after state Rep. Jason Villalba, R-Dallas, urged state leaders to create a bipartisan commission tasked with recommending "common sense" gun reforms ahead of the next scheduled legislative session in 2019. Villalba emphasized that the commission should tackle all the causes of violence — including the political third-rail of gun control. Nevárez called Villalba's proposal insufficient. "We don’t need a commission. We need bills," Nevárez said Wednesday. "What are we going to do in a commission, sit around and talk?" Nevárez and Hinojosa stressed that they did not advocate eliminating Texans' access to guns. Nevárez said he has "a lot of guns" and "no one is coming to take my guns." Nevárez did, however, criticize state leaders, including Gov. Greg Abbott and Lt. Gov. Dan Patrick, for not offering "anything that amounts to any real solution" to gun violence. Texas Attorney General Ken Paxton recently suggested that introducing armed security or arming congregants at churches could prevent similar shootings in the future — a suggestion largely panned by the speakers at Wednesday's news conference. "It’s almost fatalistic," Nevárez said. "And it will be fatal for the next group of people that are going to be killed by gun violence … if we continue down this path." Abbott has suggested this week that the federal government lapsed in failing to block the shooter, Devin Kelley, from buying three firearms. Air Force records show Kelley's domestic violence record wasn’t entered into the National Crime Information Center database. Abbott, Patrick and Villalba did not immediately respond to requests for comment Wednesday.